I recall with fondness the amazing hires we made over the years. These were the gems of our journey, and I count my blessings for having selected such dynamos. We read the tea leaves correctly; they became more than just coworkers. They became part of the family, and our cohesion grew the individual and collective talents leading to our eventual success. But I also recall a few of the unfortunate hires where we regretted our decision almost from day one. We had spent hours reading the materials, interviewing, and weighing our choices. The hiring team organized themselves into committees so that we could remain unbiased in our choice. We congratulated ourselves on nabbing an amazing candidate, only to quickly realize that they would never rise to expected standards. As I look back, there were warning signs. Little nudges in my brain that spoke softly about the “red flags” in the resume, letter, and subsequent interview. I recall other team members also raising concerns, only to talk themselves out of it in our quest to be forward-thinking, open-minded, and empathetic. Was our hiring failure more about the candidate or more about the lens we looked through? I think both the head and the heart are to blame. Using our intellect, we should have been able to clearly assess why there were short stints of employment or reasons for leaving the last place of work. Our brains, along with the right questions, should have alerted us about the candidate’s overall technical skills, or lack thereof. Our instincts should have informed us from the very first impression as to whether the candidate had the ability to get along with our team and if they actually liked working with others. Our guts can speak truthfully when we listen to the candidate process past challenges, prior bosses, and their own self-importance. We probably don’t need tea leaves to spell out whether a candidate is motivated enough to get through the learning curve. When I think of our best hires, they came neither from the pedigree background or mile-long list of accomplishments. And when I think of our poor hires, I seem to recall being infatuated with both. Looking back, we should have spotted those little red flags. Can you? 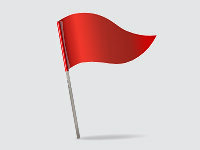 If you’re not sure, join me on Thursday, June 2, from 1:00 p.m.-1:45 p.m., for my presentation, "Using Your Instinct and Intellect to Spot Red Flags in the Hiring Process," in the Career Center located in the Four Seasons Ball Room 4. Interested in learning more? Join me and my colleague Shelia Houston on Thursday, June 2, from 1:00 p.m.-1:45 p.m., for our presentation, "Using Your Instinct and Intellect to Spot Red Flags in the Hiring Process," in the Career Center located in Four Seasons Ballroom 4.